Do you feel trapped inside because the mosquitoes are so bad outside of your home? Give Pleasant Green Grass a call today and request a free quote for our pest control services. Mosquitoes cause more human suffering than any other organism — over one million people worldwide die from mosquito-borne diseases every year. Not only can mosquitoes carry diseases that afflict humans, they also transmit several diseases and parasites that dogs and horses are very susceptible to. Why use harmful chemicals? Our organic lawn treatments for Mosquito and Tick Control are effective and 100% all-natural! It is common, especially during the summer months, to choose a harsh chemical to get rid of the critters and pests that visit your garden. Keep your children and pets safe by choosing a natural method of pest control! We use all natural ingredients in our pest control products and you’ll find the success rate is just as strong as (if not stronger than) those nasty chemicals. We use a potent blend of garlic juice spray to repel mosquitoes. The garlic used in our mosquito spray is a very powerful variety which is much more potent than the garlic found in grocery stores. Garlic contains natural sulfur which repels mosquitoes and is an all-natural alternative to chemical repellents. Farmers and master gardeners have been spraying garlic juice for years and it’s completely safe for your pets and children! The garlic scent in our formula is undetectable by human noses but is highly irritating for pests!Apply as needed during the mosquito season. We also use cedar oil as a mosquito and tick repellent. Cedar oil is an essential oil derived from conifer trees in the pine or cypress families, though not always (or even usually) cedar trees. The oil has many medical and industrial uses and is also commonly used in perfumes, aromatherapy and for pest control. It has anti-bacterial and anti-fungal properties; it’s also considered safe enough by the FDA that it’s used as a food preservative. The ancient Egyptians even used it in their embalming practices… because it keeps bugs away! This product is completely safe for people, pets and the environment and there are no instructions for staying off the lawn. It turns out that mosquitoes, along with many biting insects, are attracted to certain odors in human skin. They’re especially attracted to your body odor and other secretions, meaning that if you’re spending a lot of time running around and sweating, you can expect to have more mosquitoes following you around. Alternately certain strong—or unpleasant to the bug—smells can both hide your scent and dissuade them from getting close enough to bite you. There are several plants with strong scents that we find pleasant, which you can use to help mask your own smell and keep nearby mosquitoes at a distance. Citronella, lemongrass, catnip, marigolds, rosemary, wormwood, mint, lavender and lemon balm are all great plants to pot or plant in the areas that you want to repel mosquitoes. If you plant these helpful plants directly in your lawn, be sure to include organic fertilization & weed control in these areas to ensure the plants thrive and survive. The aroma needs to be in the air around you, at the very least, and ideally on your skin. To get the maximum effect, crush herb leaves in your hands to release their perfume and then rub the leaves and their oils over your skin. Other helpful ways to provide mosquito control include eliminating all sources of standing water if possible (including your gutters). 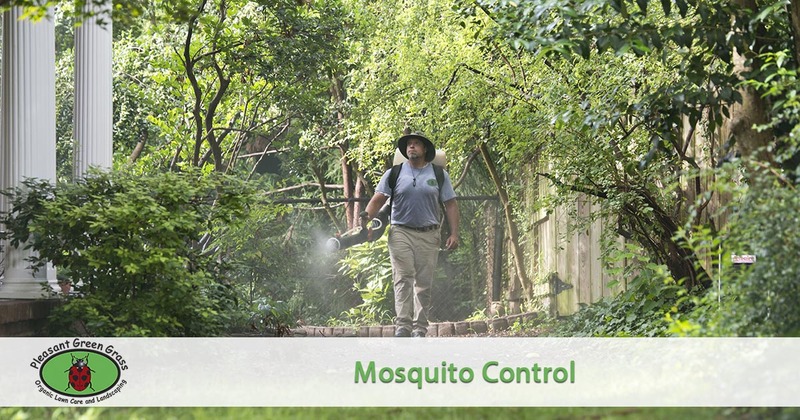 Ready to get your free quote for mosquito control services or just have questions? Give us a call at 919-357-8245 or you can always request a quote online.